This article is about the historic Royal Hospital for Seamen at Greenwich. For other uses, see Greenwich Hospital (disambiguation). Greenwich Hospital was a permanent home for retired sailors of the Royal Navy, which operated from 1692 to 1869. 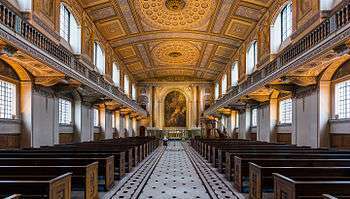 Its buildings were later used by the Royal Naval College, Greenwich, and are now known as the Old Royal Naval College. The word "hospital" was used in its original sense of a place providing hospitality for those in need of it, and did not refer to medical care, although the buildings included an infirmary which, after Greenwich Hospital closed, operated as Dreadnought Seaman's Hospital until 1986. The foundation which operated the hospital still exists, for the benefit of former Royal Navy personnel and their dependants. It now provides sheltered housing on other sites. The hospital was created as the Royal Hospital for Seamen at Greenwich on the instructions of Queen Mary II, who had been inspired by the sight of wounded sailors returning from the Battle of La Hogue in 1692. She ordered the King Charles wing of the palace—originally designed by architect John Webb for King Charles II in 1664—to be remodelled as a naval hospital to provide a counterpart for the Chelsea Hospital for soldiers. Sir Christopher Wren and his assistant Nicholas Hawksmoor gave their services free of charge as architects of the new Royal Hospital. Sir John Vanbrugh succeeded Wren as architect, completing the complex to Wren's original plans. An early controversy arose when it emerged that the original plans for the hospital would have blocked the riverside view from the Queen's House. Queen Mary II therefore ordered that the buildings be split, providing an avenue leading from the river through the hospital grounds up to the Queen's House and Greenwich Hill beyond. This gave the hospital its distinctive look, with its buildings arranged in a number of quadrants. Its four main buildings (the "Courts") are bisected north-south by a Grand Square and processional route, and east-west by an internal road from the East Gate (and gate-house) to the West Gate (and gate-house) by Greenwich Market in Greenwich town centre. The Grand Square and processional route running north-south maintained access to, and a river view from, the Queen's House and Greenwich Park beyond. Construction was financed through an endowment, financed through the transfer of ₤19,500 in fines paid by merchants convicted of smuggling in 1695, a public fundraising appeal which brought in ₤9,000, and a ₤2,000 annual contribution from Treasury. In 1705 an additional ₤6,472 was paid into the fund, comprising the liquidated value of estates belonging to recently hanged pirate Captain Kidd. The first of the principal buildings constructed was the King Charles Court (the oldest part dating back to the restoration), completed in 1705. The first governor, Sir William Gifford, took up office in 1708. The other principal buildings constructed included Queen Mary Court (planned by Wren and Hawksmoor, but not built until after Wren's death, by Thomas Ripley), completed in 1742, Queen Anne Court (architects: Wren and Hawksmoor), and King William Court (designed by Wren, but completed by Hawksmoor and Sir John Vanbrugh). Queen Mary Court houses the hospital's chapel (designed by Wren but not completed until 1742). Its present appearance dates from 1779–89, when it was rebuilt to a design by James "Athenian" Stuart after a devastating fire. King William Court is famous for its baroque Painted Hall, which was painted by Sir James Thornhill in honour of King William III and Queen Mary II (the ceiling of the Lower Hall), of Queen Anne and her husband, Prince George of Denmark (the ceiling of the Upper Hall) and George I (the north wall of the Upper Hall). 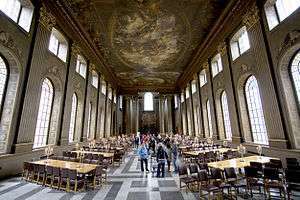 The Painted Hall was deemed too magnificent for the pensioned seamen's refectory and was never regularly used as such. It became a tourist destination, opened for viewing. On 5 January 1806, Lord Nelson's body lay in state in the Painted Hall of the Greenwich Hospital before being taken up the river Thames to St Paul's Cathedral for a state funeral. In 1824 a National Gallery of Naval Art was created in the Painted Hall, where it remained until 1936, when the collection was transferred to the National Maritime Museum, newly established in the Queen's House and adjacent buildings. On the riverside front of the north-east corner of King Charles Court is an obelisk, designed by Philip Hardwick and unveiled in 1855, erected in memory of the Arctic explorer Joseph René Bellot, who died in an unsuccessful attempt to rescue the members of John Franklin's ill-fated expedition to open a Northwest Passage in northern Canada. A Royal Hospital School opened on the site in 1712 to provide assistance and education to the orphans of seafarers in the Royal and Merchant Navies. In 1933 it moved to Holbrook, Suffolk (where it remains today); the old school buildings were reopened the following year as the National Maritime Museum. The Greenwich Hospital buildings included an infirmary, constructed in the 1760s to a design also by James Stuart, where pensioners were attended by trained medical staff (Sir John Liddell was for a time senior medical officer). After some adaptation and rebuilding this became the Dreadnought Seamen's Hospital in 1870 (taking its name from a hospital ship moored off Greenwich). The treatment for tropical diseases moved in 1919 to the Seamen's Hospital Society hospital near Euston Square, in central London, to form the Hospital for Tropical Diseases. The Dreadnought Seaman's Hospital closed in 1986, with special services for seamen and their families then provided by the Dreadnought Unit at St Thomas's Hospital in Lambeth. Greenwich Hospital closed in 1869. The remains of thousands of sailors and officers, including many of those who had fought in the Battle of Trafalgar, were removed from the hospital site in 1875 and reinterred in East Greenwich Pleasaunce also called Pleasaunce Park (named after the former Palace of Placentia which had been on the site of the hospital). 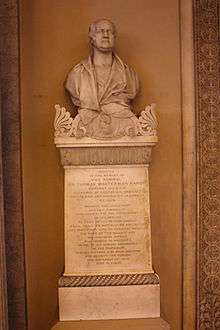 Memorial to Sir Thomas Hardy in Chapel at Greenwich's Old Royal Naval College. The charitable foundation of Greenwich Hospital still exists, although it is no longer based at the original site. It is now a Royal Charity for the benefit of seafarers and their dependants, with the Secretary of State for Defence acting as The Crown's sole trustee. The charity now funds sheltered housing for former Royal Navy personnel and the school it spawned, the Royal Hospital School, now at Holbrook in Suffolk. The charity's head office is located in the City of London. ↑ J. Bold, P. Guillery, D. Kendall, Greenwich: an architectural history of the Royal Hospital for Seamen and the Queen's House (Yale University Press) 2001. ↑ "Happy birthday Sir Christopher Wren". The Telegraph. Retrieved 9 October 2013. ↑ Kemp, Peter (1970). The British Sailor: a Social History of the Lower Deck. Aldine Press. p. 64. ISBN 0460039571. 1 2 "Royal Naval Hospital Old Burial Ground (nurses home), Greenwich, London, England". Retrieved 9 October 2013. ↑ "Conference Facilities at Maritime Greenwich". Retrieved 9 October 2013. ↑ "The National Gallery of Naval Art". National Maritime Museum. Retrieved 9 October 2013. ↑ "Memorial to Joseph René Bellot". Victorian Web. Retrieved 9 October 2013. ↑ "A Brief History of The Royal Hospital School". Mariners. Retrieved 12 November 2016. 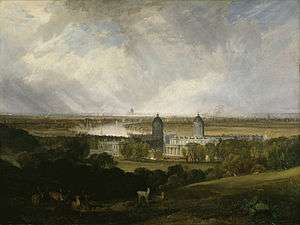 ↑ "Greenwich Hospital from the West [with the Infirmary]". The Collection. National Maritime Museum, Greenwich, London. Retrieved 6 October 2015. ↑ "History of the Seamen's Hospital Society". Seamen’s Hospital Society. Retrieved 9 October 2013. Wikimedia Commons has media related to Greenwich Hospital.